Reimagining the Urban is a daylong symposium examining art, nature, economic development and equity in the Bay Area metropolis. Artists, curators, real estate developers, environmentalists and social justice advocates gather to discuss the uses and abuses of the region’s creative and natural resources. In recent debates over the role of art and design in urban life, “San Francisco” and “the Bay Area” figure prominently, particularly in discourses and projects that tout the importance of “creativity” in the vitalization of the urban. Recently, Richard Florida and others most closely allied with this ethos have acknowledged the limits and blindspots of the “creative class” discourse. Meanwhile, artists, civic leaders, curators, and community activists on the ground were already quite clear that the “creativity” theme only went so far toward addressing issues of immigration, social justice, environmentalism, and the stabilization of artistic and social welfare sectors. This gathering seeks to take the temperature of current urban arts debates in the Bay Area, asking how artists, designers, and civic activists have redefined the local landscape and their relationship to it. If the “creative class” discourse celebrated the Bay Area in terms that many of us question, what alternate terms might we emphasize instead? How do different cultural practices activate and/or resist a contemporary urban landscape? How do artistic and civic sectors differently understand site-specific work? How have cultural and activist organizations embraced and simultaneously redefined the role of science and technology in the Bay Area landscape? How does a wider understanding of the environmental justice in the Bay Area redefine the role of the arts in re-imagining “urbanity?” Finally, what is the potential and what are the limits of cross-arts, cross-sector coalition-building …and what new skills and platforms are required to facilitate it? 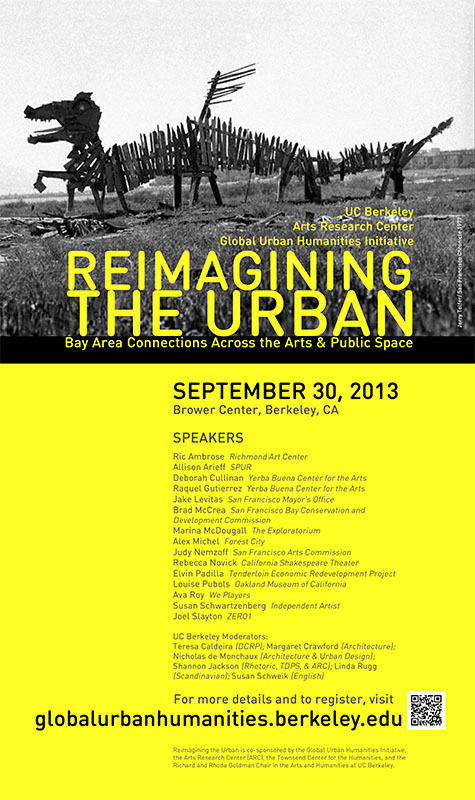 Reimagining the Urban is co-sponsored by the Global Urban Humanities Initiative, the Arts Research Center (ARC), the Townsend Center for the Humanities, and the Richard and Rhoda Goldman Chair in the Arts and Humanities, in conjunction with the course The City, Arts, and Public Spaces: Methods Across Disciplines, at UC Berkeley.